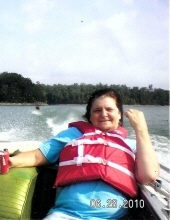 Judy L Hoskins, 67, of Manchester, KY, passed away Monday, April 8th, at the Hazard ARH Hospital. Judy was born in Manchester, KY on January 23, 1952, a daughter of the late Ora (Senters) Smith and L.C. Smith. She is survived by her husband, Glen Hoskins, and by two sons: Gregory Hoskins and wife LaTasha of Fogertown and Daniel L. Hoskins and wife Kisha of Burning Springs. Judy is also survived by three sisters: Geneva Abner of Jackson County, Juanita Hobbs of Horse Creek and Teresa Ellis of Laurel County; by three brothers: Larry Smith of London, Terry Smith of Virginia and Joe Smith of Horse Creek; and by 21 grandchildren and 14 great grandchildren. In addition to her parents, Judy is preceded in death by her son: Glen David Hoskins, and two step sons Glen Anthony Hoskins and Jimmy Wayne Hoskins; and by the following brother and sisters: Glen Smith, Wanda Arnold and Linda Riley, as well as her grand daughter Robin Judith Hoskins. Services will be held at 11:00 AM on Thursday, April 11th at Britton Funeral Home in Manchester, KY, with Jerry Holland, Jerry McKinley Holland and Richard Sams officiating. Burial will follow at the Hoskins Cemetery on Big Creek. Visitation will be held 6:00 PM on Wednesday, April 10th at Britton Funeral Home in Manchester, KY.
Britton Funeral Home is in charge of the arrangements. To send flowers or a remembrance gift to the family of Judy L Hoskins, please visit our Tribute Store. "Email Address" would like to share the life celebration of Judy L Hoskins. Click on the "link" to go to share a favorite memory or leave a condolence message for the family.